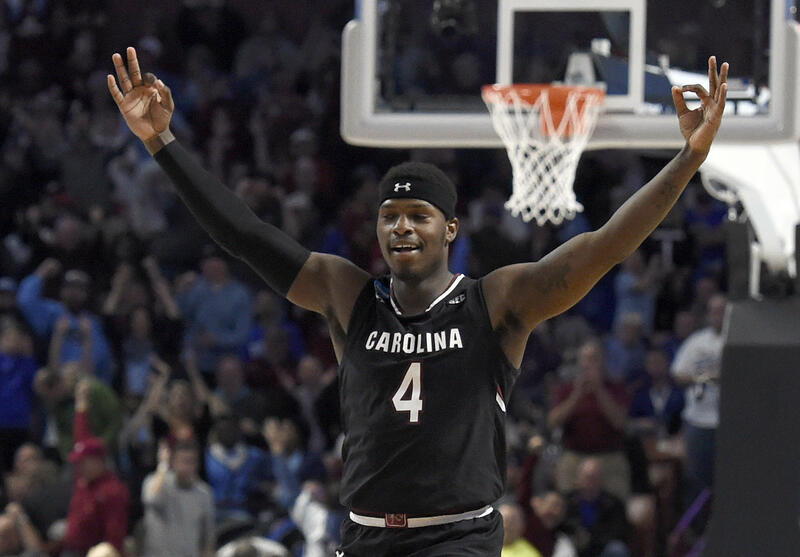 GREENVILLE, S.C. -- Sindarius Thornwell had 24 points, Chris Silva scored 13 of his 17 points in the second half and seventh-seeded South Carolina stunned No. 2 seed Duke 88-81 on Sunday night to advance to its first Sweet 16 in the NCAA Tournament’s expanded bracket. The Gamecocks (24-10) trailed by 10 points early in the second half after one of its coldest shooting stretches of the season to start. But behind Thornwell’s outside shooting and Silva’s dominance underneath, South Carolina rallied to win two NCAA games for the first time in 44 years. The Gamecocks rushed to their fans when things were over, celebrating one of the biggest wins in program history. Next up is the East Regional at Madison Square Garden where the Gamecocks will face third-seeded Baylor, an 82-78 winner over Southern Cal earlier Sunday. Duke (28-9) was attempting to reach the round of 16 for the sixth time in eight seasons. The Blue Devils, though, could not surmount South Carolina’s stifling defense. Leading scorer Luke Kennard had his second straight subpar shooting game, finishing 1 of 6 for 11 points before fouling out. The Blue Devils made five of their eight 3-point attempts in the first half, yet only 5 of 19 after the break. They had tied a season high with 18 turnovers against the relentless Gamecocks attack. Duane Notice had 17 points for South Carolina, 14 in the second half. Silva added 10 rebounds for his fourth double-double this season. Grayson Allen led Duke with 20 points. It sounded like typical coach hyperbole when Duke’s Mike Krzyzewski said the Gamecocks would be the best defensive team his club has faced this season. That proved out in the first half as the Blue Devils were continually disrupted by South Carolina’s pressure and coughed the ball up 13 times after averaging only 11 turnovers a game this season. The Blue Devils did not make a basket after Matt Jones’ 3-pointer with 5:38 to play, their only points coming on Allen’s foul shots in the final minute before the break. Duke did its share to thwart the Gamecocks on defense, too, holding South Carolina to 7-of-35 shooting the first 20 minutes. The Gamecocks missed 20 of their last 22 shots to fall behind 30-23 at the break. South Carolina: The Gamecocks had not won an NCAA Tournament game in 44 years coming into the weekend. Now, they’re looking to advance to the Elite Eight with another victory. Quite a turn for a team that had lost five of its last seven games before the NCAAs. Duke: The Blue Devils had lived by the 3-pointer much of the season and when those didn’t fall in the second half, it surely cost them. They’ll certainly be a different looking team next year with seniors like Jones and Amile Jefferson finishing up and freshmen like Jayson Tatum, considering the NBA. South Carolina plays third-seeded Baylor in the Sweet 16 at Madison Square Garden on Friday.